A lack of Customs systems interconnectivity coupled with delays and inaccuracies in the paper based exchange of cross-border trade data between Customs administrations continues to negatively hamper trade facilitation and regional integration efforts in the Southern African Customs Union (SACU). The situation translates into unsatisfied traders, unreliable trade statistics, controversies around Member States’ allocations from the common revenue pool, and high revenue leakage risks. The stakes are high. A common information technology (IT) system would address issues related to trade data used to determine the revenue share of each SACU Member State. The SACU common revenue pool consists not only of Customs duties, but also excise duties. Customs duties are shared on the basis of intra-SACU trade (imports), while excise duties are shared on the basis of a Member State’s gross domestic product (GDP) as a percentage of SACU’s total GDP. Obviously, this requires reliable trade statistics, especially on goods moved between Member States. Moreover, the SACU revenue sharing formula also provides for a development component into which a fixed percentage of excise duties that have been collected across the Common Customs Area is paid. Member States’ shares from this component are based on a number of developmental indicators. Exchange of information among SACU Member States is also critical to the fight against commercial fraud and to creating a level playing field for companies in the region. It also supports a wider vision where deeper regional integration is seen as a tool to promote development and create an ever closer community among the peoples of Southern Africa, including moving towards the establishment of an economic community in the future. The efforts of the SACU region in establishing Customs systems interconnect iv it y and real-time electronic/automated exchange of trade data can be traced back as far as 2005. To date, the region is still pacing towards achieving this long awaited objective. an IT Connectivity Blueprint for Customs systems interconnectivity, which defines a technical standard for the actual transmission of declaration data between SACU Member States. Moreover, a critical mass of IT and operational officers has been trained on how to develop message specifications based on the WCO Data Model. The objective is, among other things, to enable SACU Customs administrations to develop harmonized and standardized electronic messages, and to enable them to achieve their goals when it comes to the interconnection of Member States’ Customs computer systems. At present, Lesotho, Namibia and Swaziland use UNCTAD’s Automated System for Customs Data (ASYCUDA World), South Africa uses Interfront Customs and Border Management Solution (iCBS), and Botswana uses Crimson Logic. 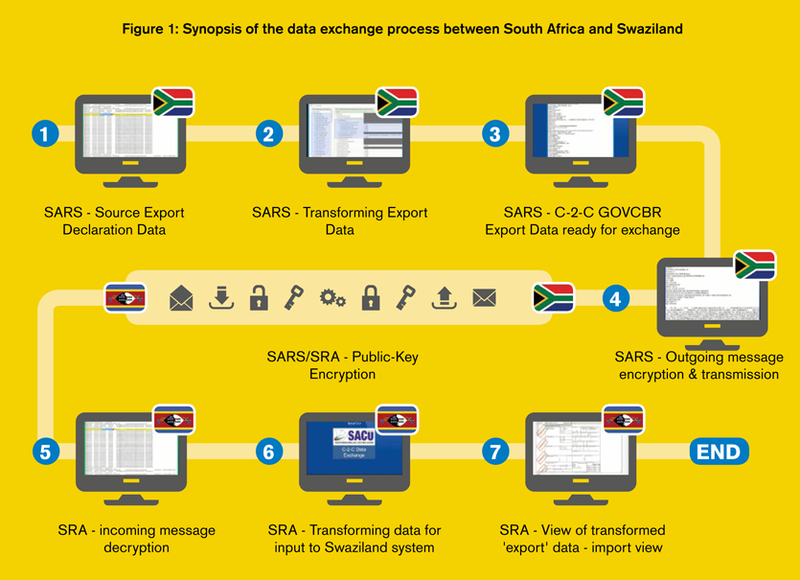 A pilot involving data exchange was conducted between South Africa and Swaziland, to look into systems interconnectivity between the iCBS and ASYCUDA World systems (see figure 1 for a synopsis of the data exchange process). The pilot confirmed the feasibility of exchanging import/export information on a daily basis between the two Customs administrations: real-time exchange capability exists between the two administrations with minor systems development required by South Africa. During the pilot, as an example, Swaziland Customs used export information from the South African Revenue Service’s (SARS) Customs administration to frame a Swaziland import declaration for VAT collection purposes. However, legislative issues and data protection concerns coupled with misaligned prioritization and timing of Customs Systems modernization has continued to delay the achievement of SACU’s regional ambitions when it comes to IT connectivity. In March 2017, SACU celebrated the coming into force of the Mutual Administrative Assistance legal instrument, Annex E of the SACU Agreement of 2002. However, Annex E itself requires further implementation arrangements at the bilateral or multilateral level, which the Union is currently battling with. The critical issues of concern require bilateral/multilateral implementation arrangements that include data protection, especially of personal information, i.e., any information relating to an identified or identifiable natural person. Personal data requires a special level of protection to ensure the fundamental right to privacy of individuals, particularly relevant when large-scale automatic exchange of information (AEoI) will occur. In addition, SACU Member States’ national legislation is not necessarily similar and mutually compatible, and based on past experience, national legislation processes normally take extended periods of time to reach enactment or ratification. However, it should be mentioned that in terms of the current SACU Agreement, as amended, Member States shall apply similar legislation with regard to Customs and excise duties, except as otherwise provided in the Agreement. As a result of these challenges, the region now realizes the need for a “single Customs legislation” to govern SACU as a whole. The current arrangement, where each Member State has its own legislation, is yielding minimal benefits toward efficient trade facilitation and regional integration. Thus, it is high time that SACU Member States’ policy makers urgently consider developing a single Customs legislation, which will bring tangible trade facilitation benefits to traders, while promoting further regional integration. The SACU consists of five Member States – Botswana, Lesotho, Namibia, South Africa and Swaziland – with a combined population of over 61 million people and a combined GDP in excess of 500 billion US dollars. The history of SACU dates back to 1910, making it the world’s oldest Customs Union. In 2002, a new SACU Agreement was negotiated to take into account regional political and global economic developments. Having entered into force on 15 July 2004, it introduced a number of new provisions, which did not exist in the previous arrangement, and transformed the Customs Union into a new organization with a strong emphasis on common institutions and common policies. To further deepen SACU’s integration, the current SACU Agreement provides for the development of a common industrial policy, and a policy for regulating unfair trade practices. It also provides for cooperation in agriculture policies and competition policies. In addition, it provides for a common negotiating mechanism for trade negotiations with third parties. The Agreement was amended on 12 April 2013.